Encountering paper jam while using a printer is inevitable. Your printer might be one of the advanced printers but a piece of wrinkled paper can grind it to halt. Some printers flash led light indicating that it needs help. Most of paper jam happen when the paper feeding through the printer goes wrong. Sometimes the printer overlooks the problem and expels a crumpled mess into an output tray. On other occasions, the printer stops functioning during the assigned printing job, and the folded mess gets stuck inside the printer. If something is awry with the edge of the paper i.e., the side of the paper that goes in first for printing, the printer refuse to load it. Hence you should examine the sheets for folds, wrinkles, or any other type of damage as a printer can only load even pages. If the paper twists in an erroneous way depicting sheets rolling outward against the rollers. This disable the printer to pull in the paper in a proper manner. To avoid this, just remove curled sheets from the paper tray. De-curl the pages and load it again. Friction among sheets occur when multiple sheets are stacked together. Due to overloading, first sheet in the stack may not drop properly into the rollers. In this scenario, simply shake all the sheets to loosen them up. Sometimes dust may also be held accountable for paper feeding issues. With time, dirt can build up on rollers which therefore diminishes its grip. Because of this, the roller fails to pull in sheets for printing. Remove the dust with cleaning sheet provided by the manufacturer at the time of purchase. In case, if you don’t have a cleaning sheet, you can clean the roller with the help of a sticky paper. Remember, the sheet must be slightly sticky otherwise glue can ruin the rollers. Packaging tape, address labels, or duct tape can be other options to clean dirty rollers. If the printing sheet has some black zone on it, then it can be difficult for printer to identify the paper. Ensure that you feed all white papers so that such problems never crawl up in future. 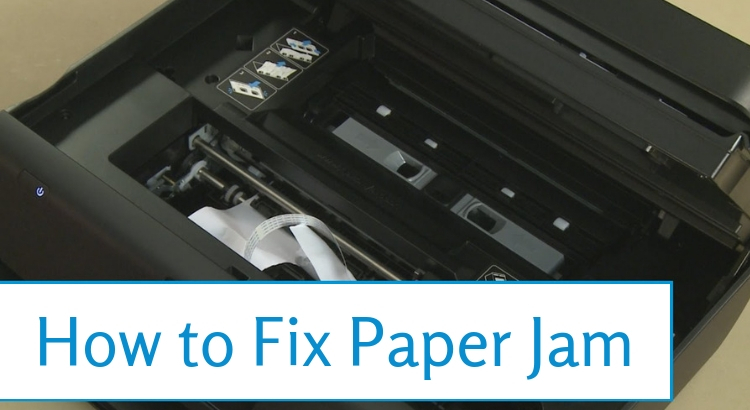 Paper jam can arise in multiple areas of a printer. If you are unable to detect the paper jam in one area, go to the next area until you discover the jam. Empty the paper tray and press ‘resume’ button. If multiple papers are stuck in the printer, remove one sheet at a time. Hold the crumpled paper with both hands and apply even pressure to pull the sheet towards you. While ejecting one or two sheets at a time from middle of the stack, pressure is released causing even the remaining stack to come out. Once you have removed the paper, ensure no piece of paper is stuck in the printer. Now, try to print, if this printer problem remains, check for the paper jam in another area of printer. Remove any loose or stuck paper from the rear access door. Turn the knob on the rear access entryway counter-clockwise and remove the door to pull out the jammed sheet. Ensure there is no scrap of paper inside the printer. Attach the rear access door and turn on the knob clockwise. After completing the process, try to print. 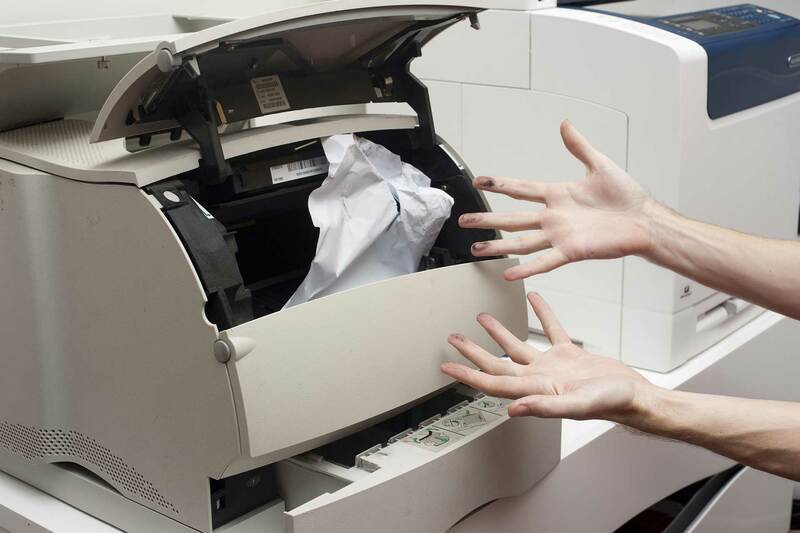 If the error still exists, find out the paper jam in another area of the printer. Check the output tray area for paper jam. If exists, gently pull out the stuck paper from beneath the front cover. 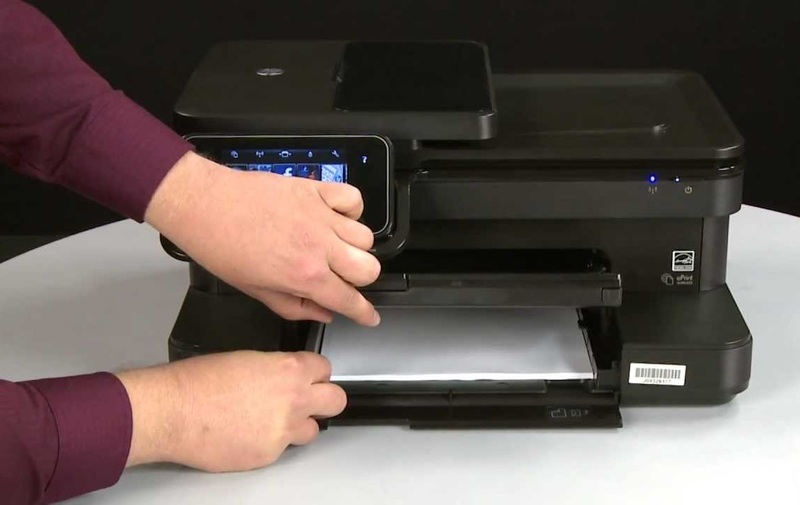 Take out the paper from the back of the printer or inside the paper-in tray using even pressure with both hands. Never move above the front cover in order to take out the jammed sheet from the printer. Pulling out paper quickly increases the chance of damaging the printer, so pull slowly. If you still facing issues related to paper jam or paper feed, call our nerds to get instant printer support. Have you ever encountered a paper jam? What methods did you follow to resolve it? Let us know about paper jam experience with your printer in the comments.